Apprising Ministries is one of the few labors in the Lord which is addressing the current drift away from sola Scriptura in contemporary evangelicalism. This falling away has opened the door for highly subjective and spiritually corrupt Contemplative Spirituality/Mysticism (CSM) with its Contemplative/Centering Prayer (CCP), all of which flowered in the antibiblical monastic traditions of apostate Roman Catholicism. Men and women, right now this CSM is spreading as a cancer within the visible Christian church through the spurious Spiritual Formation as taught by Living Spiritual Teacher and Quaker mystic Richard Foster along with his spiritual twin Dallas Willard. In Christianity Today Promoting the Cult of Richard Foster a few years back I told you about a feature interview with Foster in Christianity Today magazine. And AM also showed you in Christianity Today Promoting the Roman Catholic Mystic Catherine of Siena there’s not even an attempt to hide evangelicalism’s lust for this centered on the self mysticism. The main reason for this is that for years now evangelicals really have been moving away from sola Scriputra and toward the more existential neo-orthodox view of Scripture. Think of the Bible studies you’ve been in where everyone discusses how they “feel” about a given text.In simple terms, we’ve slowly been taught to interpret the text of the Bible by what one thinks God might be saying and how we then feel about it. Having been through the “Experiencing God” (EG) program when it was first a rage within the Southern Baptist Convention in the mid 90’s I am quite familiar with it. And I also know that it unfortunately laid the foundation for so-called “Christian” mysticism now openly taught by entire State Conventions of the SBC. This I’ve shown you even years ago in Georgia Baptist Convention (SBC) Now Promoting the Cult of Richard Foster and Apostasy, Contemplative Spirituality/Mysticism (CSM) in the SBC and Disease in the Church where I bring out the epidemic within evangelicalism of me-no-wanna-see-i-tis. Concerning EG Christian apologist Bob DeWaay tells us in his Criticial Issues Commentary piece Unbiblical Teachings on Prayer and Experiencing God: How Mysticism Misleads Christians that Henry Blackaby “does start out with some basic facts about the gospel.” However, DeWaay is exactly right when he says that “the reader is [then] quickly ushered into the realm of subjectivity that permeates Blackaby’s approach from beginning to end.” This is that neo-orthodox “feelings-oriented,” and very wrong approach to the Bible I spoke of earlier. Essentially what we are getting with EG is a mysticism-lite where we “feel” we’re having direct experience with God. But how do we know that it’s really God and not just reaction from e.g. some bad potato salad we may have eaten? This is the exact same kind of concern Dr. Gary Gilley expresses concerning the supposedly safe “spiritual formation” teaching of Donald Whitney, which you can read in Book Review: “Spiritual Disciplines for the Christian Life” by Donald S. Whitney. 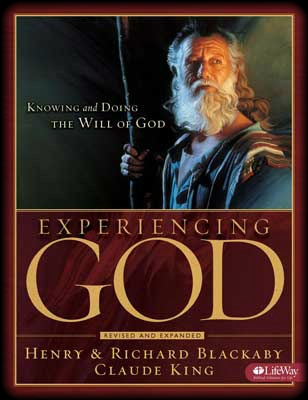 Gilley also reviews EG in Experiencing God by Henry Blackaby.